I have one funny story about this feast day. About 18 years ago or so, I took my three little boys to mass on this feast day because I wanted them to experience this blessing that I myself had only a foggy memory of. Remember, I was just reverting back to the faith myself around that time. Anyway, my parish church was having mass at a local convent chapel that day so we traveled over there and I got my three unruly boys to be somewhat quiet and respectful. The priest saying the mass that day was from Nigeria. My family had sort of befriended him and he played soccer every Friday with my oldest son and I ended up typing his dissertation for his doctorate. But that day, he was saying mass for the nuns and a few of us lay people. When it came to the blessing, someone gave him the crossed candles and he proceeded to light them! When one of the nuns, looking a little flustered said, "Oh no Father, don't light them!" He looked relieved, and I'm sure the rest of us breathed easier as well! This must not be a popular blessing to give in the Nigerian Dioceses! 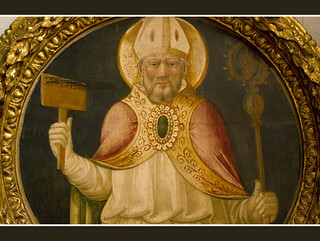 St. Blaise has achieved perennial popularity in both the East of his origin (hewas bishop of Sebastea in Armenia) and in the West. However, like many anotherfavored saint, we know little about his life. His (undependable) medieval legend gives the following biography. Blaise was a boy of high intelligence, so his parents gave him a good Catholiceducation. He went on, then, to the priesthood. While still a young man, hewas chosen bishop of Sebastea, Armenia. In 316, the Roman Emperor Licinius withdrew from his position of toleratingChristians, and started again to persecute them. Blaise, counseled by God, wentinto hiding in a woodland cave. There his only company was the wild animals;but the gentle bishop soon made friends with them, healed their wounds, andblessed them. One day, however, some hunters invaded his wilderness in search of wild animalsthat could be used in the stadiums to fight gladiators and devour Christians. They were surprised to find the bishop, and, of course, him and brought him backfor trial. On the trip, says the legend, the party came upon a poor woman whosepig had been carried off by a wolf. Bishop Blaise commanded the robbing animalto return the pig, and so he did, safe and sound. On arrival at the court, thefuture martyr was imprisoned in a dark jail without food to eat or light to seeby. Out of gratitude, the woman whose pig he had restored managed to get himfood and provide him with candles. Another woman brought to the saint herlittle boy, who had caught a fishbone in his throat and was on the point ofstrangulation. Blaise miraculously got rid of the bone. But Governor Agricolaus treated this merciful unmercifully. Before imprisoninghim, he had him scourged. In due time Emperor Licinius himself arrived, triedto "convert" the bishop to paganism by tearing his body with iron wool-combs,and finally sentencing him to beheading. Blaise's subsequent popularity stemmed particularly from his repute as a miracleworker. Three classes of devotees arose: those associated with wild animals;professional wool-combers (with whose tools he had been tortured); and peoplewho wanted to heal or avoid a throat illness. 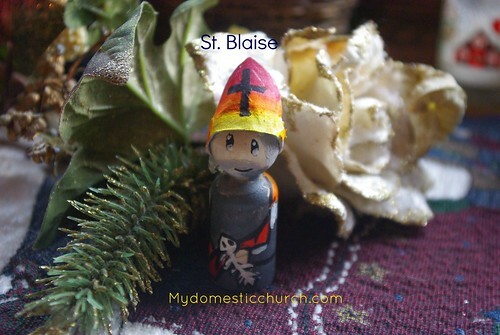 In Germany, St. Blaise came to behonored as one of the cluster of "handy" saints called the "Fourteen HolyHelpers". Because Wednesdays are a heavy work day for me and a co-op day for the kids, we can't get to mass today for the blessing, but we can use the candles we had blessed yesterday at Candlemas to bless our own throats - after all, they have lay people at church give the blessing, so why can't we bless each other? 1634 A lay minister touches the throat of each person with the crossed candles and, without making the sign of the cross, says the prayer of blessing. Through the intercession of Saint Blaise, bishop and martyr, may God deliver you from every disease of the throat and from every other illness.